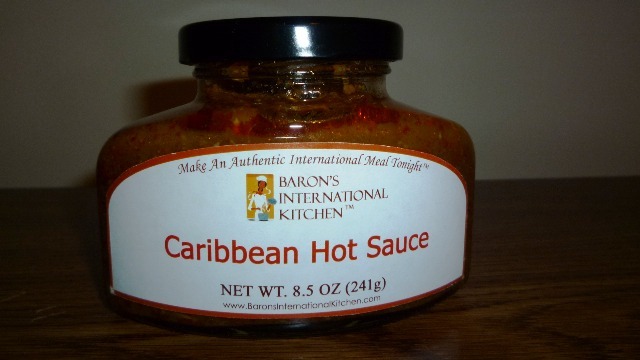 REVIEW: Baron’s International Kitchen’s Caribbean Hot Sauce – I Love It Spicy! This is the 2nd and last review for the Baron’s Caribbean line. The first was the Hot Jerk Sauce, and this one is their version of hot sauce. We once again assemble our team of reviewers with Wendy the Spice Goddess, Wayne Brawley, and yours truly. I love gyros…thanks for the tip Spice Goddess! Wayne, I love the on location stuff, great job! I apologize for the length of the video. I was a last minute substitution, and did not have time to edit it down. I can’t wait to try these products!! My mouth is watering, I love the carribean flavors, espcially when they are really spicy!! Wendy, it was great that we both thought of the tzatziki sauce. I was going to get a gyro, but my town in VA doesn’t have a good place for it. Yeah, Wayne thanks for that. It was cool! I love gyros too, Spice Goddess and I hadn’t even thought of using it on those. Next time I have one, I’m definitely going to try it. It was so much fun!! It took me a while to get the review done, but I thought it would be cool to do it IN Jamaica, and it definately was! I truly loved these sauces!! Great job, and best of luck luck to you guys!